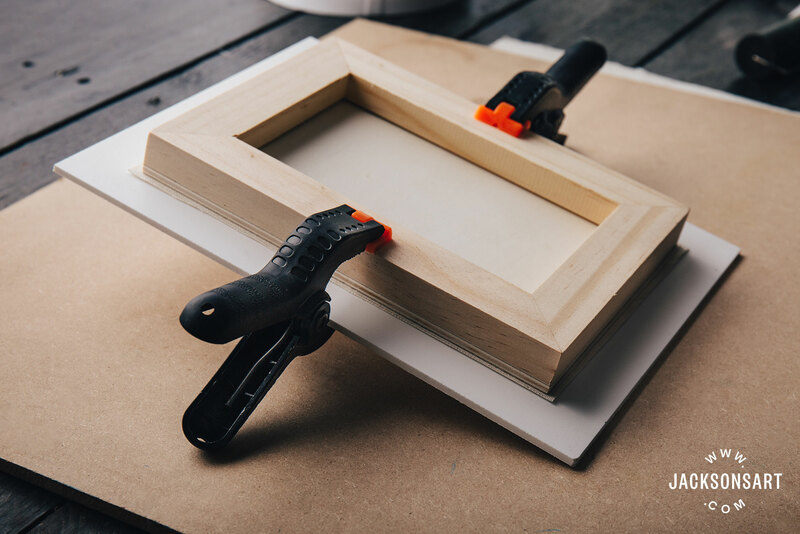 Canvas panels are the perfect solution for artists who like the weave of a canvas but not ‘bounce’ that you get when canvas is stretched on a stretcher bar frame. 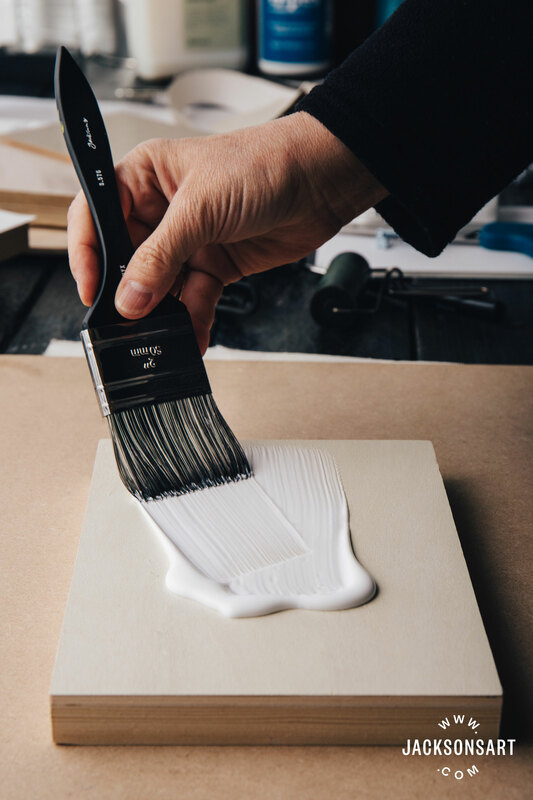 You can enjoy painting on a rigid surface that has the texture of your favourite primed or unprimed canvas by fixing it onto a wooden panel. 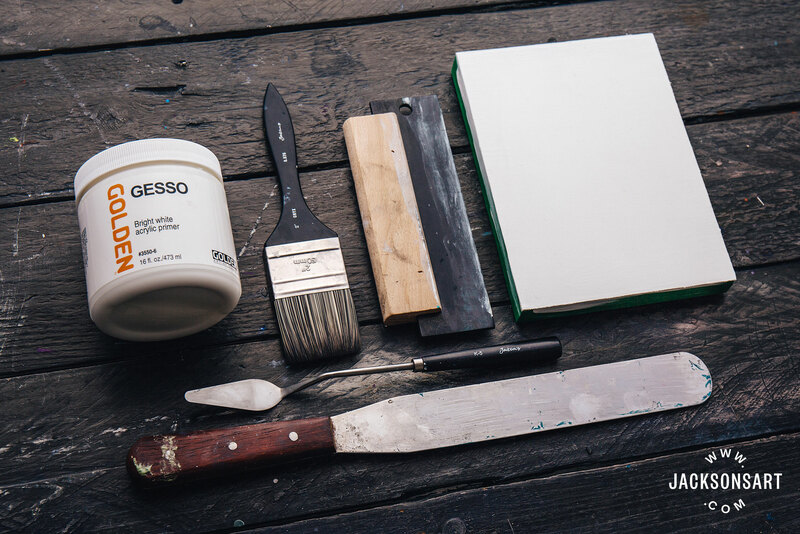 There are other reasons you might want to paint on a canvas panel. A thin panel will fit in a pochade box for plein air painting, where a stretched canvas will not. 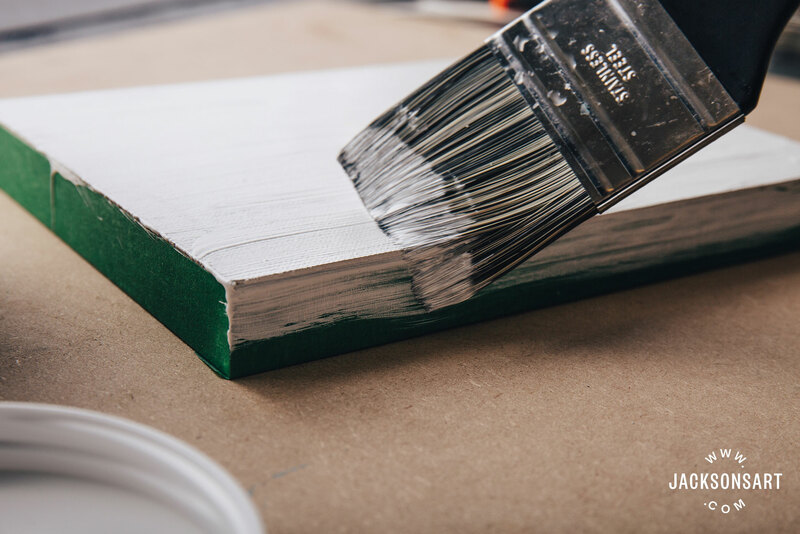 In addition to the bounce during painting, a stretched canvas can be more difficult to store safely. 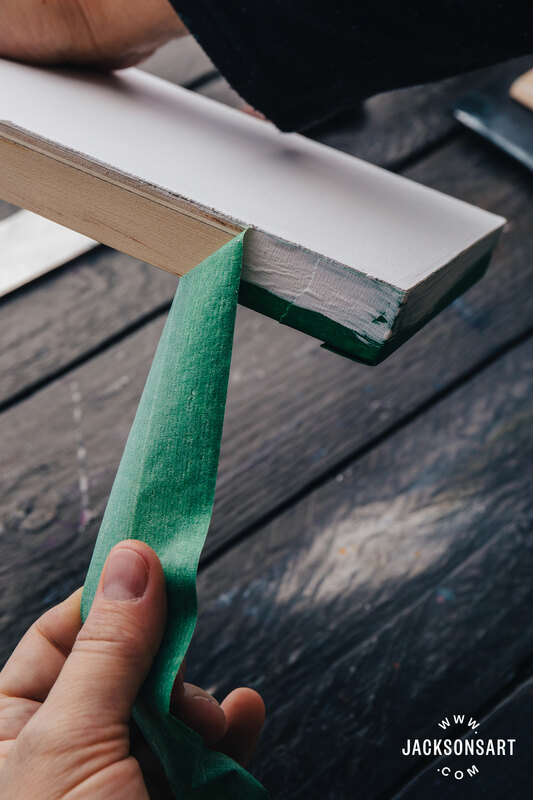 Essentially you are dealing with a relatively inflexible paint layer adhering to a flexible material, which can be easily dented or squashed, which can lead to the paint cracking or flaking off. 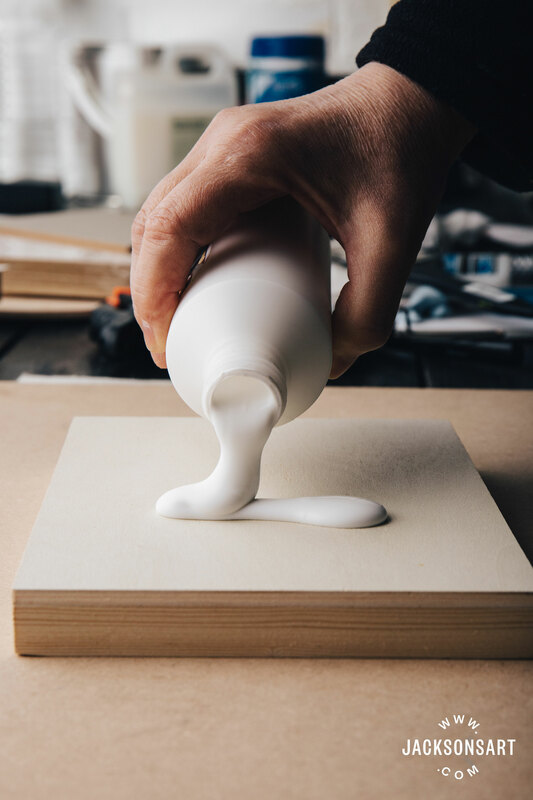 A rigid surface is required for some mediums such as encaustic painting where the flex of a stretched canvas would crack the surface. 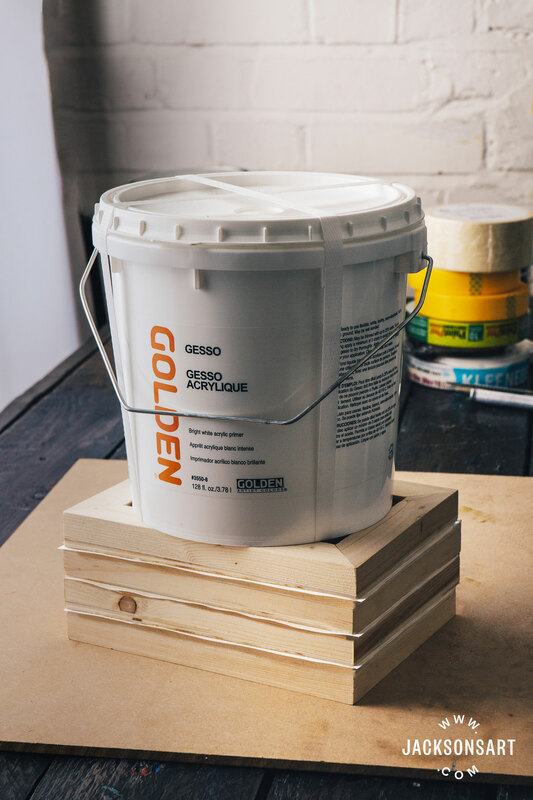 Also, it is considered more conservationally sound to use a rigid surface for oil painting, to prevent cracking over time, though with large paintings stretched canvas may sometimes be a better choice as you also have to balance the considerations of weight and transportability. 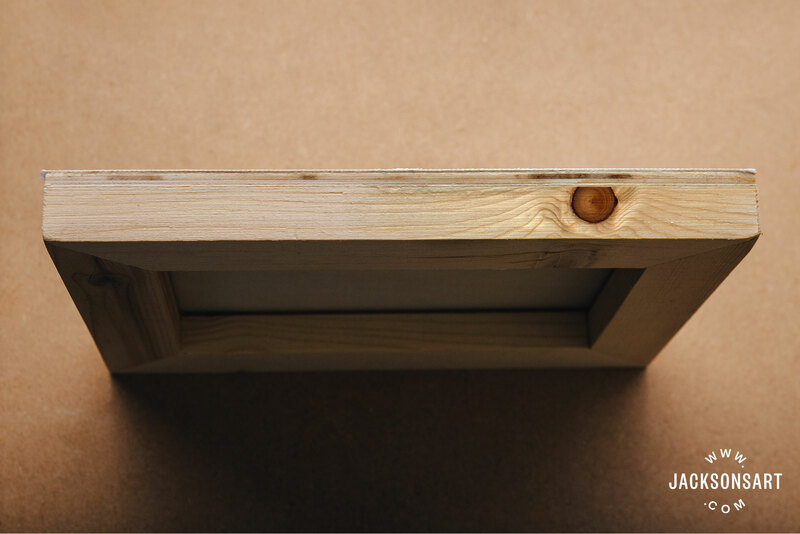 The Jackson’s Smooth Plywood Panels are great if you want an edge of wood around the back side so you can hang the panel on a screw or attach a wire for hanging; it can be a standard depth or a deep-edged panel. 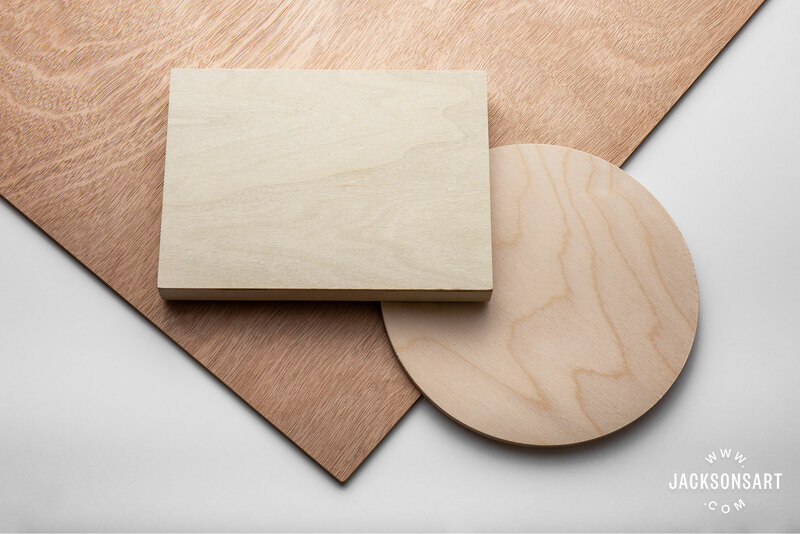 You can also use many other rigid surfaces like wood, MDF or Gatorfoam board. 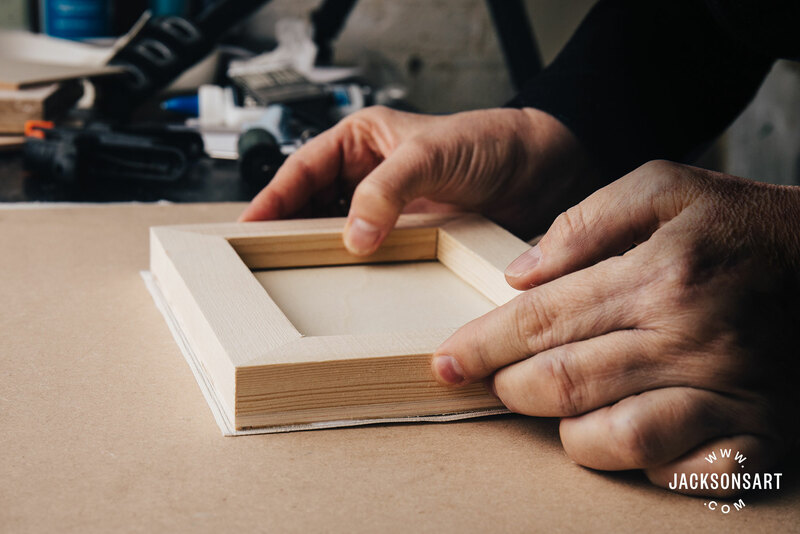 For panels that fit into plein air painting pochade box slots you will need a thin, un-cradled panel like MDF, mountboard, or either size of the Multimedia Artboard panels – the 3.2mm ready-to-mount boards that comes with glue already applied or the ultra-thin 0.8mm boards. A great way to minimise waste is to save any off cuts of canvas that you might have after stretching canvas to make your own small canvas panels, or you can purchase canvas by the metre. 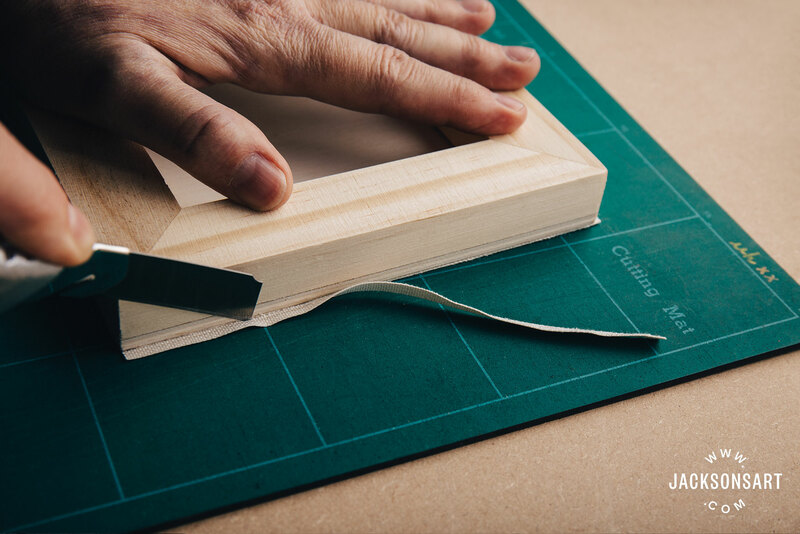 When cutting your piece of canvas be aware that the glue will wet your canvas and it may shrink a few mm as it dries, so cut it a few mm larger than your panel. I trace around the panels (on the wrong side of the canvas if it’s primed) with a pencil and then cut a little outside the line. Lining up the panel with the weave before you trace around it looks tidy and reduces the distraction of a slightly diagonal grid pattern. 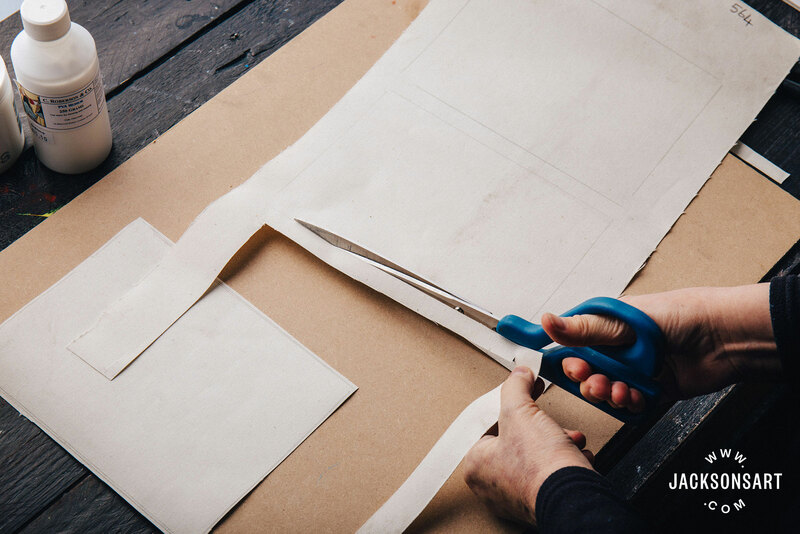 Here I am cutting the second of three pieces out of a length of leftover canvas. Notice that I cut outside the pencil lines on the already cut piece. 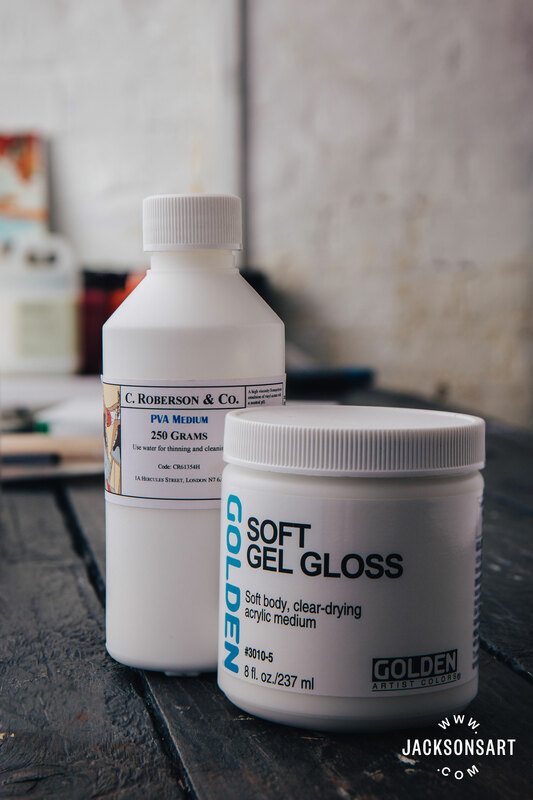 The most commonly used glues are soft acrylic gel, PVA for a permanent bond, or re-moistenable PVA to allow the painting to be removed from the panel in the future by wetting with water. 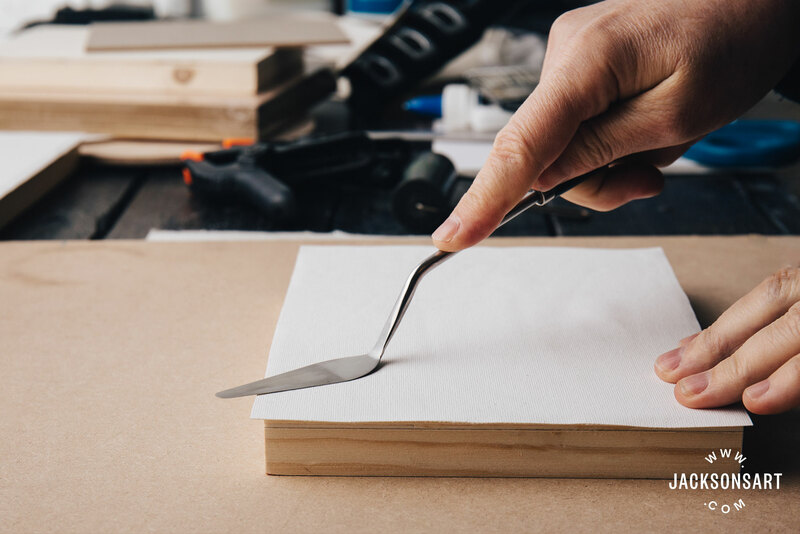 Brush your chosen adhesive evenly onto your wooden panel. 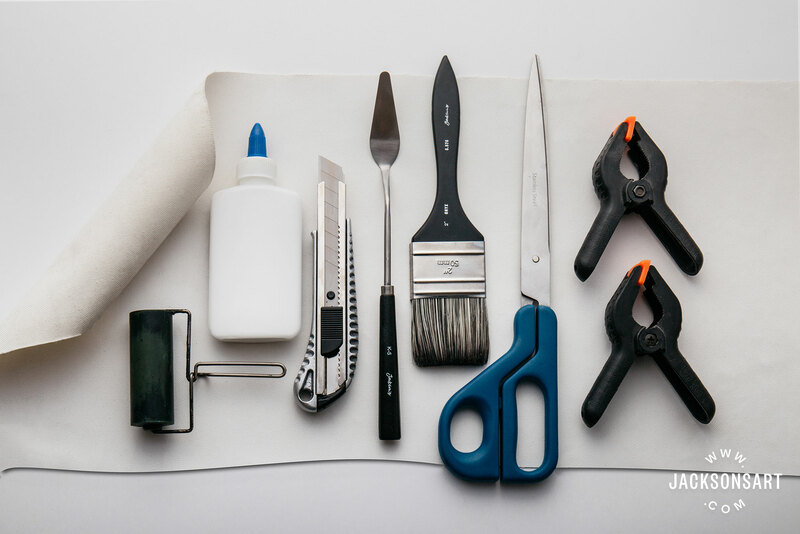 Do not be skimpy as most glues shrink a lot as the water evaporates and you can end up with too thin a layer. 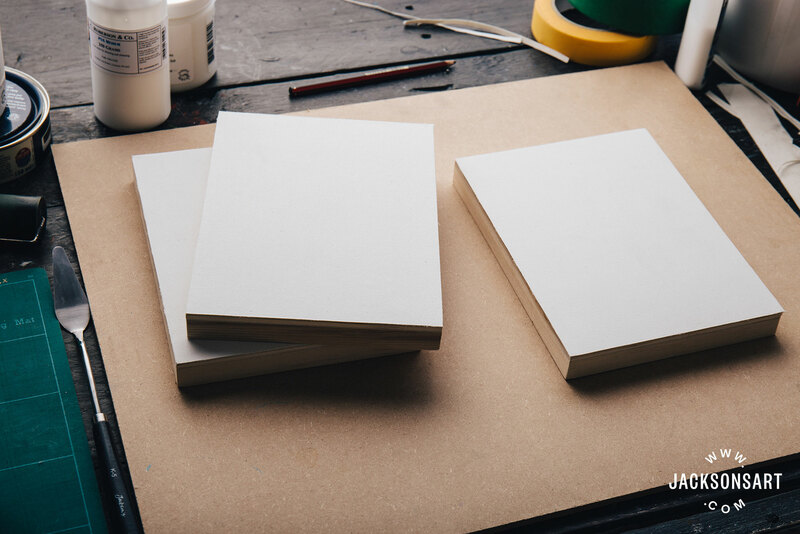 Lay your board with the canvas side down and place heavy weights on the back so it dries under pressure. You can make a few boards and as each one is finished add it to the stack under the weights. When stacking be sure to line up them up pretty evenly or add a larger board in between, so there is pressure all the way to each corner. If you are using cradled panels like these face them in pairs towards one another and stack, this helps create even pressure. 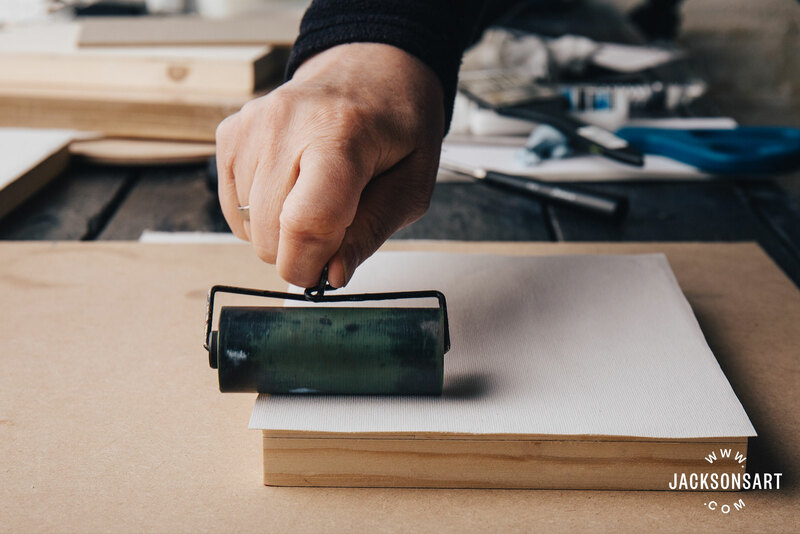 Another good way to create pressure is to put a plain board against the front and use four strong clamps all around to press the canvas flat and let it dry for a day. I use clamps if I am doing one or two boards and weights if I am doing more, because I don’t have enough clamps. 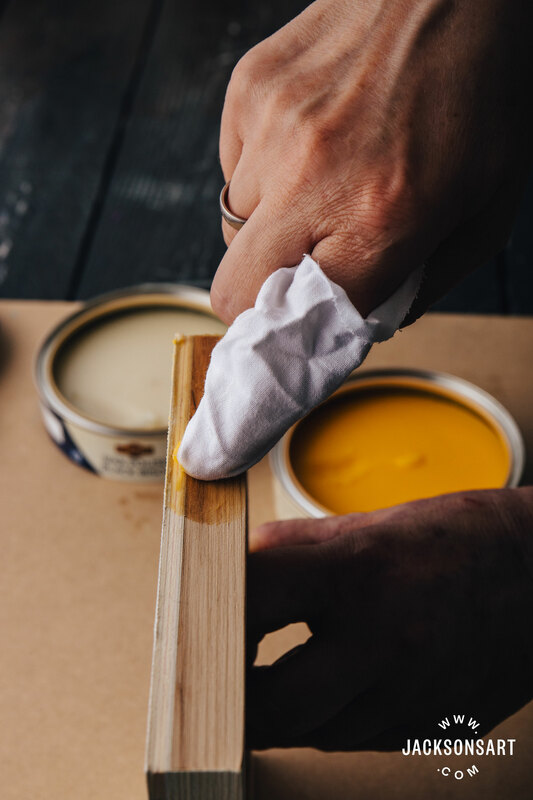 If you are affixing the canvas to a cradled panel and have left the sides bare wood you can still treat them to keep them from picking up stains and finger prints by either sealing them with a varnish, wood sealer or clear wax. Liberon paste wax in clear or neutral gives a nice finish to the bare wood on the sides of a cradled panel. The Clear is truly clear and the Neutral gives a warm yellow finish. 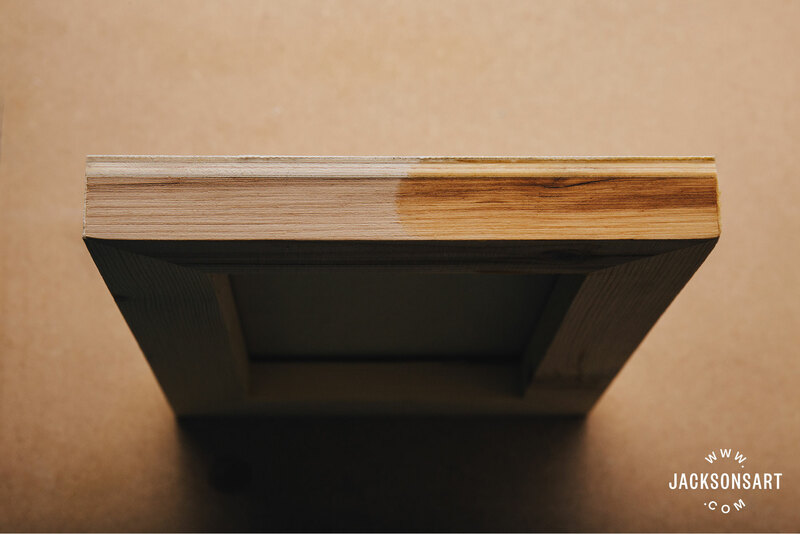 Apply to the sides of the panel with a clean cloth or wire wool and buff after 20 minutes when it is dry. If you are concerned about getting wax on the canvas on the front you may wish to mask off the front with some tape. Liberon paste wax in clear or neutral gives a nice finish to the bare wood on the sides of a cradled panel. 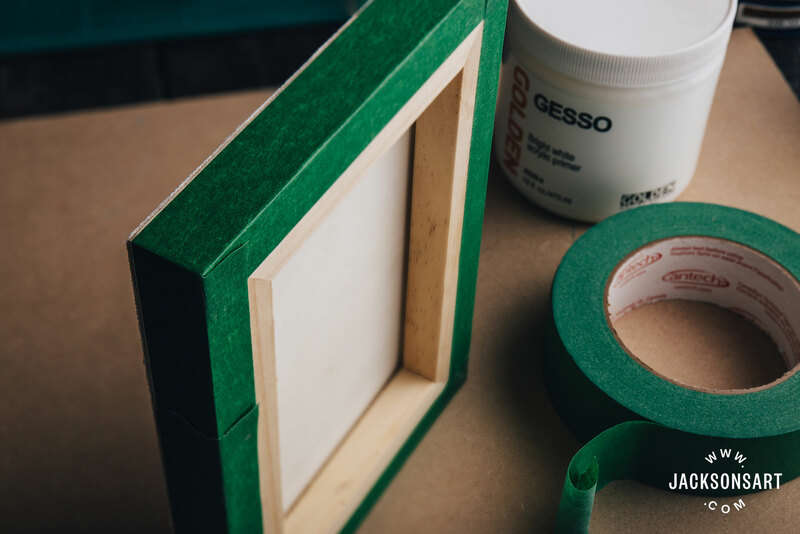 Apply to the sides with a clean cloth or wire wool. If you are concerned about getting wax on the canvas on the front you may wish to mask off the front with some tape. 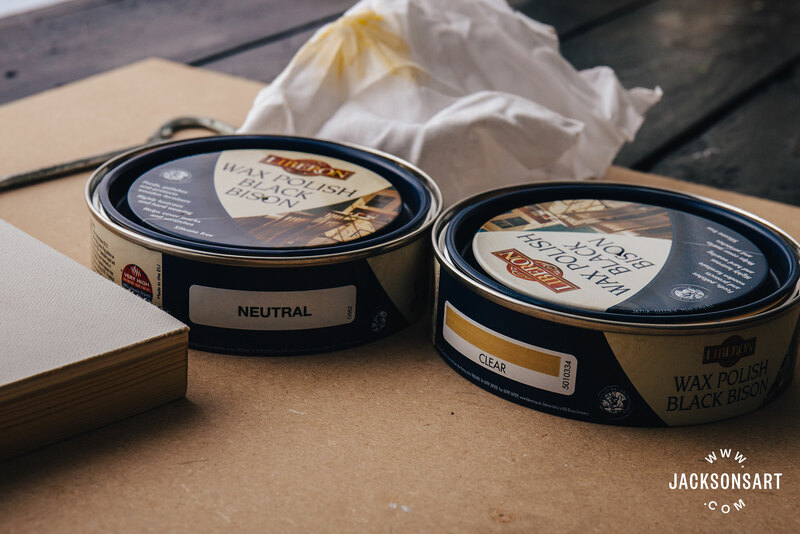 The Liberon waxes shown in the back of the photo are Clear on the left and Neutral on the right. The side of a canvas panel with the Liberon Clear wax on the right half. It gives a smooth, sealed finish compared to the unfinished side, but barely changes the colour. The side of a canvas panel with the Liberon Neutral wax on the right half. It gives a smooth, sealed finish compared to the unfinished side, deepens the wood colour and increases the warmth.